Muffins are a delight for everyone; a quick snack in the morning for breakfast, midmorning tea, coffee in the late afternoon, school lunch boxes... the list goes on and on. However, shop bought muffins are dry and taste like cardboard especially if they are gluten free. I have been using this recipe for ages and it never fails me. It is very easy to adapt to a normal wheat flour muffin recipe as well. Play around with the flavours, these muffins are flop-proof. I took the original recipe from a Nigella Lawson version, but have added to it and changed it so much I guess it is now my own, but I have to give her the credit for the inspiration! Preheat the oven to 180 degrees and grease a 12 cup muffin tray, unless you are using paper muffin cases. Grate the apple and set aside. The rest is so easy you could make these with your eyes closed. Measure out all the ingredients and simply add them to a bowl. Use a spatula and mix. Be careful not to over-mix the batter. If you find your mix is dry, add a little more buttermilk. It needs to feel like a wet dough. The apple is added at the end, skin and all. 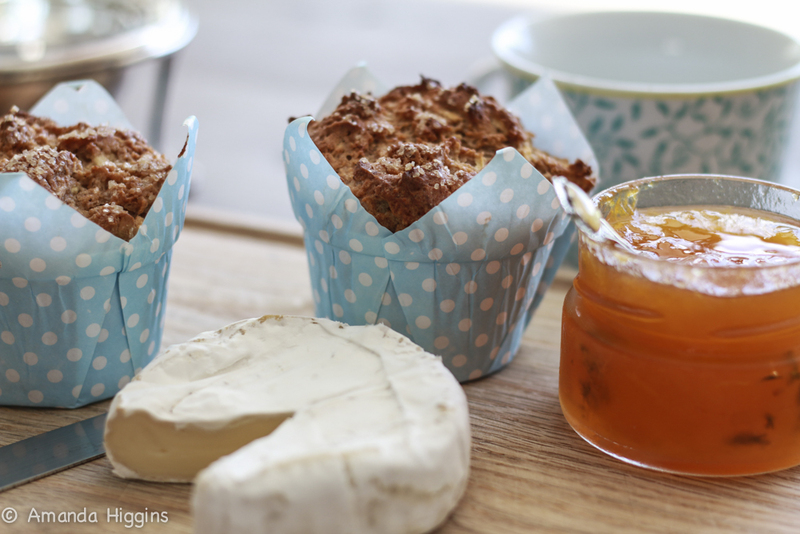 I love adding the skin as it gives more flavour and a real rustic chunky feel to the muffins. Fill each muffin cup to the height you desire. They don't tend to rise in the way a traditional wheat muffins would in the oven, so you can fill the muffins cups without the worry of the batter touching the top of the oven. Sprinkle the top of the muffins with a little brown sugar or cinnamon or both, and bake for 45 minutes or till they are nice and brown. Do over cook them a little as the centre is very moist and tends to need extra cooking time.These are delicious for breakfast with a ripe brie cheese and blackberry jam! I have used the same recipe and half filled the muffins cups with batter, making a small indent with a spoon. I have used either shop bought salted caramel or made some of my own. Place a half teaspoon of caramel into each little indent and top with more muffin batter. Bake the muffins as per the recipe. The caramel tends to ooze out a little and make these sticky and like a cinnamon bun. Yum! In this version I use two grated pears; omit the cinnamon and mixed spice, and add 3 teaspoons of ground ginger. If you wanted to add a little zing add a tablespoon of chopped preserved ginger to the mix. So fragrant! In this version leave off the sugar, fruit and the spices, and add 2 teaspoons of Dijon mustard and 2 cups of grated chedddar cheese ( although this is an amazing way of using up all those bits and pieces of old cheese in the cheese drawer in the fridge.) I then add a 1/2 cup of chopped parsley and a 1/2 teaspoon of salt to the batter and sprinkle a little paprika on the top of each muffin before baking! Breakfast in a jiffy! To make a normal wheat floured muffin, replace the rice flour with normal flour and leave out the xanthan gum. Simple as that! ooh! box – your personal tasting journey!